SELVAM Lazarus knew there was more in life to achieve when he left Baling, Kedah in 1985 to seek greener pastures in Brickfields, Kuala Lumpur. Holding to a dream to have a better life for his family, Selvam left his job as a rubber tapper to set up a food stall with help from his niece, Thanaletchumy Angamuthu. Thanaletchumy, who was already running a stall selling chapatti did not hesitate to lend her uncle a helping hand. Their simple menu of vegetables, chicken varuval, mutton peratal, fried fish and a variety of curries appealed to the residents and the working crowd in Brickfields. 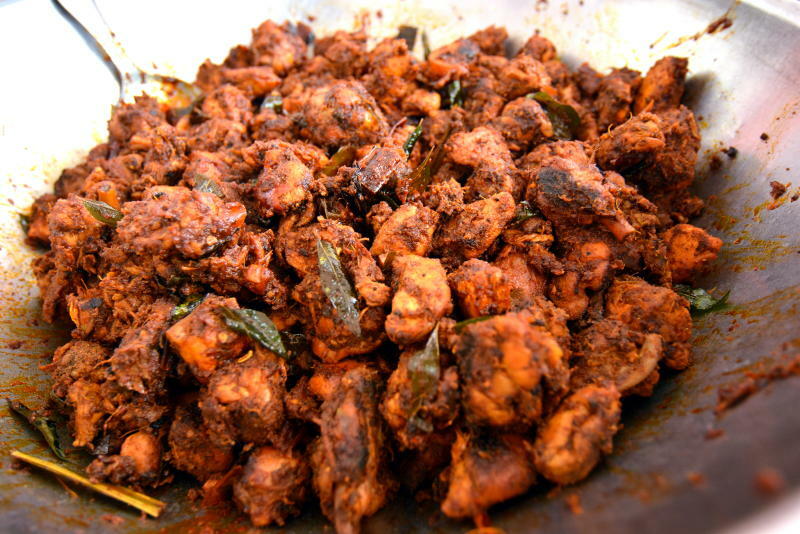 The chicken varuvel is a hot seller at Selvam’s Corner. Today, 31 years later, Selvam’s Corner is a familiar dining destination among locals and is known for its home-cooked South Indian fare. Although Selvam, 69, can still be seen at his stall, located at the corner of Jalan Tun Sambanthan and Lorong Chan Ah Tong, he takes a backseat in business operations and lets his son, Ganesan run the show. He does, however, lend his daughter-in-law Nalini Munusamy who helms the kitchen, a helping hand. Nalini, who is Ganesan’s wife, took over from her mother-in-law Sinnamal Edward, who has retired from the kitchen and prefers spending time at home. 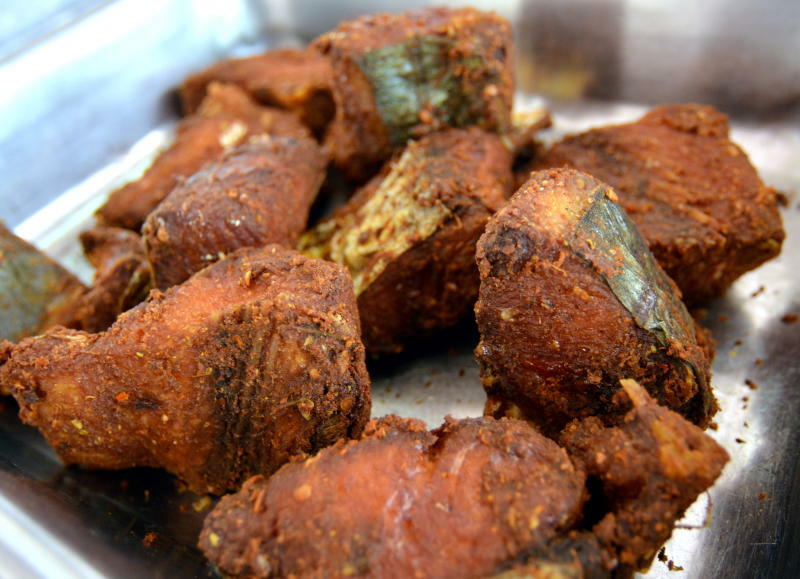 Whenever Selvam is at the stall, he prepares the marinade for their popular fried fish which has about 10 ingredients. Using thick pieces of Spanish mackerel, Selvam’s marinade includes dried chillies, Thai chillies and chilli powder among other ingredients. Breaking into the fish’s aromatic golden brown exterior will reveal succulent and soft white meat within. 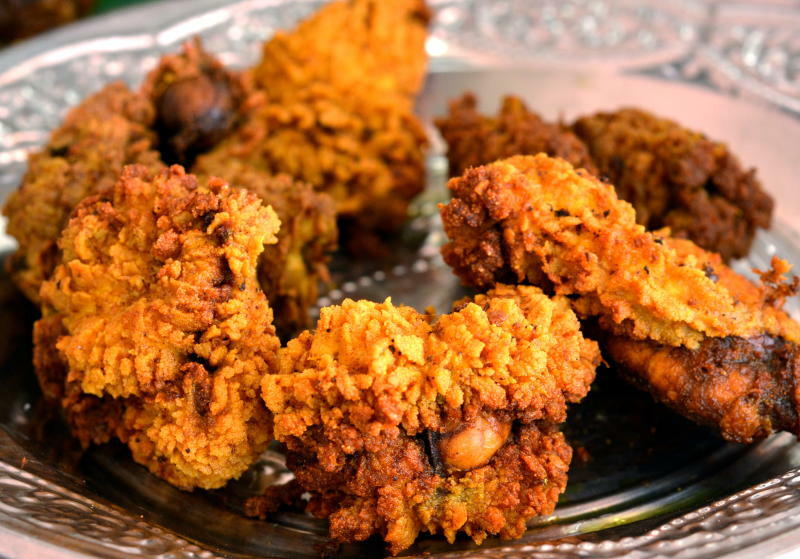 Selvam’s Corner is known for its chunky pieces of Spanish mackerel. The fish is good on its own or with a serving of rice, a choice of curry and vegetables. In fact, it is not surprising to see diners requesting for more fish as it is quite addictive. The full of flavour mutton and chicken varuvel are also crowd favourites. The stall, which opens for lunch at 11am, is known for its everyday staples of 15 dishes including three types of vegetables, chicken varuval, mutton peratal, curries and of course, fried fish. “The number of dishes is the same for many years now. “Our regular customers come here expecting to have the fried fish or mutton peratal, so the menu never changes but only the choice in the type of vegetables differ,” said Selvam. Selvam said more than 30kg of chicken and up to 200 pieces of Spanish mackerel was needed to cater to customers, for lunch and dinner. Ganesan Selvam is a familiar face at Selvam’s Corner as he continues his father’s business in Brickfields. While those who visited the stall in the 80s and 90s would have remembered seeing Selvam or Ganesan frying fish in front of the stall, these days, all the cooking takes place in the kitchen. “When Kuala Lumpur City Hall upgraded the stalls at Lorong Chan Ah Tong, they built proper stalls with a cooking area. “So now, all the cooking is in the background,” he said. As parking may prove to be a challenge in the area, it is best to catch a cab to head down for some appetising home-cooked food. The stall is open from 11am to 4pm and 6.30pm to 9.30pm. It is closed on Saturday and open for lunch on Sunday. Selvam’s Corner is located in Lorong Chan Ah Tong, Brickfields, Kuala Lumpur.